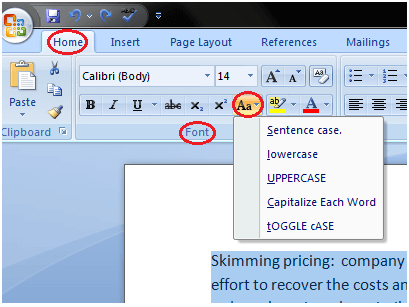 Sentence case: It capitalizes the first letter of each sentence. Lowercase: It changes the text from uppercase to lowercase. Uppercase: It capitalizes all the all letters of your text. Capitalize Each Word: It capitalizes the first letter of each word. Toggle Case: It allows you to shift between two case views, e.g. to shift between Capitalize Each Word and cAPITALIZE eACH wORD .